You've added Old Goa, Fort Aguada, Tomb of St. Francis Xavier, and other attractions to your itinerary. There's still lots to do: stroll through Palolem Beach, take in the spiritual surroundings of Basilica of Bom Jesus, identify plant and animal life at Animal Shelter Agonda, and admire the landmark architecture of Se Cathedral. To find maps, other places to visit, and other tourist information, you can read our Goa planning site . Chennai to Goa is an approximately 6-hour combination of flight and bus. You can also do a combination of flight, taxi, and train; or drive. When traveling from Chennai in May, plan for slightly colder days in Goa, with highs around 36°C, while nights are about the same with lows around 32°C. Finish up your sightseeing early on the 13th (Mon) so you can travel to Jaipur. Kick off your visit on the 14th (Tue): see the sky in a new way at Jantar Mantar - Jaipur, get engrossed in the history at City Palace of Jaipur, then step into the grandiose world of Amber Palace, and finally look for gifts at Gems Paradise. On the 15th (Wed), you'll have a packed day of sightseeing: admire the striking features of Birla Mandir Temple, admire the landmark architecture of Hawa Mahal - Palace of Wind, and then admire the landmark architecture of Sheesh Mahal (Hall of Mirrors). To see more things to do, reviews, traveler tips, and more tourist information, read Jaipur online trip itinerary builder . Traveling by combination of bus and flight from Goa to Jaipur takes 8.5 hours. Alternatively, you can do a combination of bus, taxi, and flight; or drive. While traveling from Goa, expect somewhat warmer days and about the same nights in Jaipur, ranging from highs of 48°C to lows of 32°C. Finish up your sightseeing early on the 15th (Wed) so you can go by car to Agra. On the 16th (Thu), admire the landmark architecture of Jama Masjid (Agra), then walk around Mehtab Bagh, then admire the striking features of Tomb of Itimad-ud-Daulah, and finally take in the history at Mother Teresa's Missionaries of Charity. Keep things going the next day: step into the grandiose world of Agra Fort, admire the striking features of Jahangir Mahal, and then admire the striking features of Taj Mahal. To find reviews, ratings, maps, and tourist information, you can read our Agra holiday builder site . Traveling by car from Jaipur to Agra takes 3.5 hours. Alternatively, you can take a train; or take a bus. In May, daytime highs in Agra are 48°C, while nighttime lows are 30°C. Cap off your sightseeing on the 17th (Fri) early enough to go by car to New Delhi. Your day-by-day itinerary now includes Lotus Temple as well as Red Fort (Lal Quila). Start off your visit on the 18th (Sat): contemplate in the serene atmosphere at Lotus Temple, contemplate the long history of Humayun's Tomb, then contemplate the long history of India Gate, and finally examine the collection at National Museum. 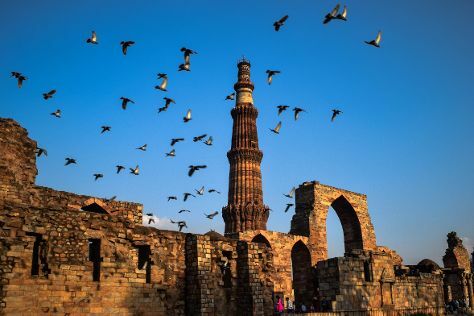 Get ready for a full day of sightseeing on the next day: make a trip to Red Fort (Lal Quila) and then admire the striking features of Qutub Minar. To find reviews, where to stay, photos, and other tourist information, go to the New Delhi trip itinerary planner . Traveling by car from Agra to New Delhi takes 3 hours. Alternatively, you can take a train; or take a bus. Expect a daytime high around 47°C in May, and nighttime lows around 30°C. Finish up your sightseeing early on the 19th (Sun) so you can travel back home.